Student inventions from 2009 InPulse competition presented Apple-preserving cushion, vacuum refrigerator, rescue boat that floats above the water, urban traffic jam minimisation system, braceletshaped control system, 21st century calliper gauge, time machine. Hatvan – On 20 November, an extraordinary exhibition opening put on display the innovations reaching the final of the InPulse National Engineering Competition, organised by the Association of Hungarian Engineering Students (IAESTE). Under the title Race for Time, this test of creativity and innovation attracted entries by more than 50 teams from mechanical and electrical engineering faculties of Hungarian universities. 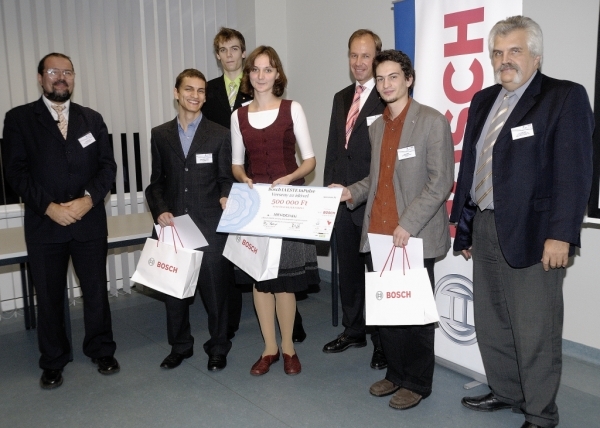 The main sponsor of the event was the Bosch Group Hungary. The competition brief was to design a freely-interpreted time machine. The organisers were looking for ideas which speed up or simplify processes, saving time for users. Some of the finalists had come up with products which make everyday life more sustainable; others had invented new ways of dynamically controlling urban transport systems or operating public utilities. The final, linked to an interactive exhibition held in the Bosch plant in Miskolc, involved seven teams. “Our national competition was aimed at involving as many engineering students as possible, and presented them with obstacles they do not normally encounter at university, encouraging them to pursue original thought and creativity. The first IAESTE InPulse Competition, on the theme of the “time machine”, forms the basis of a series of events which will be a fitting contribution to the 2008 European Year of Creativity and Innovation,” said Bálint Pongrácz, chief organiser of the IAESTEBosch InPulse Competition. The competition had two rounds. The teams first presented their inventions at the HVG Jobs Exchange, as part of the National Training and Career Days Engineering Days. The assessment jury included eminent representatives of the Hungarian Chamber of Engineers, the Public Foundation for Applied Research and Kitchen Budapest, who provided the professional authority behind the assessment criteria. Other members of the jury were delegated by the City of Budapest, Budapest Polytechnic and Bosch. The teams which reached the final in Hatvan were Coquelicot, Igendesign, Truthahn, Tabula Hungariae, and The new E.T. 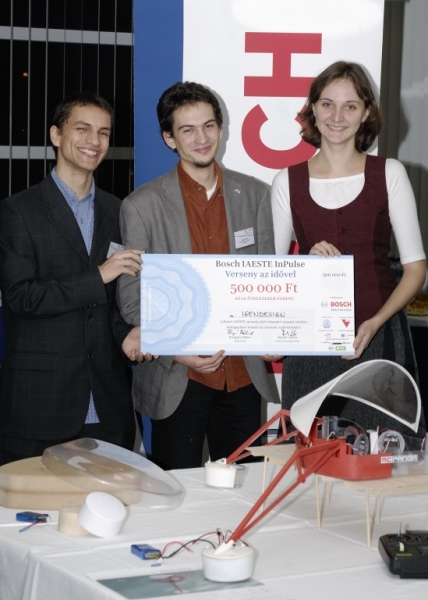 They received financial support to produce models of their designs for the final contest. 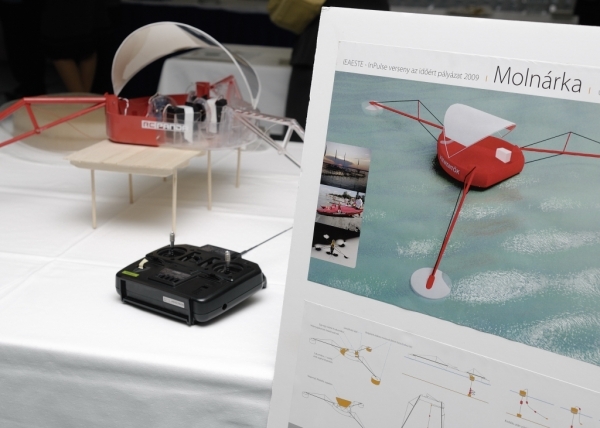 The winner of the InPulse Competition is the “Molnarka”, the universal rescue ship, the invention of the IGENDESIGN, from the Budapest University of Technology and Moholy-Nagy University of Art and Design. “Bosch plans in the long term, and sees education as the best growth-stimulating investment. In our view, engineers are the key to the future and to sustainable development. The Bosch name is linked to innovation, technology at the highest level, environmental awareness, and social responsibility. The InPulse competition embraces all of these concepts. It is a competition bringing together minds which can combine theoretical knowledge, practical application, and creativity,” said Dr Sven Ost, Technical Plant Manager of Robert Bosch Elektronika Kft., in his welcoming address. After being displayed in Hatvan, all projects and plans entered to the competition will go on a travelling exhibition whose venues will be colleges and universities throughout the country. This entry was posted in works and tagged boat, bosch, coast, guard, molnárka by igendesign. Bookmark the permalink. Cobgratulations, it’s great! Nice model.